Cerebral palsy is a group of chronic but non-progressive disorders that affect body movements and muscle coordination, caused by lesions during brain development of the fetus or newborn. The degree of cerebral palsy varies from minimal to extremely severe incapacity. The many manifestations of cerebral palsy can be categorized in five main types: spasticity, athetosis, ataxia, rigidity and dystonia. Spasticity affects 50 to 60% of children diagnosed with cerebral palsy. It causes jerky movements and may lead to posture and coordination problems. Over the past twenty years, different treatments have been developed for different degrees of impairment and allow children and their families to have a better quality of life and more motricity. These treatment modes can be complementary. Therapies: Occupational therapy, physiotherapy and speech therapy help children to learn how to use their limbs and to develop motor skills. Orthopedic surgery: Orthopedists Dr. Thierry Benaroch, Dr. Marie-Andrée Cantin and Chantal Janelle perform corrective surgery on the bones and tendons to allow better use of a limb, reduce its rigidity and reduce the pain associated with spasticity. Botox: The botox injections administered by Dr. Thierry Benaroch, Dr. Marie-Andrée Cantin and Dr. Chantal Janelle are used for children with a shallow impairment located in one or two muscles, because the quantity of the drug used for each treatment is limited. Botox treatment must be repeated regularly and is usually combined with physiotherapy to stretch the affected muscles and tendons. Selective rhizotomy: Since 1991, Dr. Jean-Pierre Farmer, neurosurgeon, has completed more than 225 selective dorsal rhizotomies. Children who have the potential to walk are those who can benefit from this surgery. This treatment involves all the muscles of the lower limbs, however, improvements are often felt in the upper limbs. During surgery, nerves are stimulated; response is recorded and monitored by pediatric neurologist Dr. Poulin and her team in order to allow selective elimination of spastic movements. Once the spasticity is eliminated, the muscles can be strengthened and the child can support himself and walk. The radicellectomy is followed by intensive physiotherapy and occupational therapy at the Hospital. Baclofen pump: Before 1999, there weren’t many solutions to relieve children affected by spasticity too wide spread for botox and whose muscle tone was too weak for radicellectomy. These children are often confined to a wheelchair and usually suffer from secondary conditions, such as hip dislocations and scolioses, because of their great spasticity. A pump diffusing a medication called baclofen is installed under the skin with a long tube along the spinal column. The baclofen is diffused continuously, allowing overall of spasticity, a decrease in discomfort, improvement of the child’s quality of life and facilitation of the child’s hygiene. The children also seem to show gains in speech and the use of their upper body. Hand function in children with hemiplegia (one side of the body affected): comparing surgery, botox and therapy. Since cerebral palsy affects children at various levels, at SHC-Canada, the child and the family are supported by a multidisciplinary team, in addition to the orthopedists and the medical and surgical teams. Nurses Sarah Mondoux and Christina Oesterreich help families manage appointments, obtain prescriptions and prepare for surgery. They also act as resource people when the families need additional medical assistance. According to Joanne Ruck, Head of the Physiotherapy Department at SHC- Canada, the role of physiotherapists is to teach the child to move without the constraints of spasticity. We want to help the child progress from on low functional level to a higher level: for example, if he gets around by crawling prior to surgery, we will work with to use walker following surgery. Occupational therapist Marie-Élaine Lafrance helps children become functional in activities of daily living, refine their fine motricity and adapt to the special needs and challenges of using ortheses and wheelchairs. Social worker Catherine Dubé helps children and families deal with the impact of cerebral palsy on the emotional, relationship and financial levels and on family and social dynamics. She helps families find local and community resources and build a support network, if applicable. Educators in the Child Life and School Services play an important role for children who are hospitalized for surgery. They normalize the hospital experience through play and help the child avoid falling behind in school, thus easing the return home. 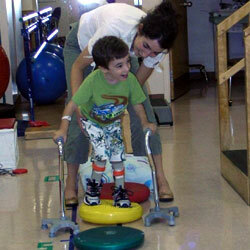 Supported by his physiotherapist Corinne, Benjamin learns to walk after his selective dorsal rhizotomy.